The Initiative 1634 campaign would keep in place the city of Seattle’s recently enacted soda tax but bar other local governments from taking up such measures. OLYMPIA — An initiative campaign funded primarily by soft-drink companies seeking to block local governments from enacting new taxes on soft drinks and food handed in its signatures Thursday for the November election ballot. The Yes! To Affordable Groceries campaign is spearheading Initiative 1634, which would retain Seattle’s recent soda tax but bar other city and county governments in Washington from taking up similar measures. 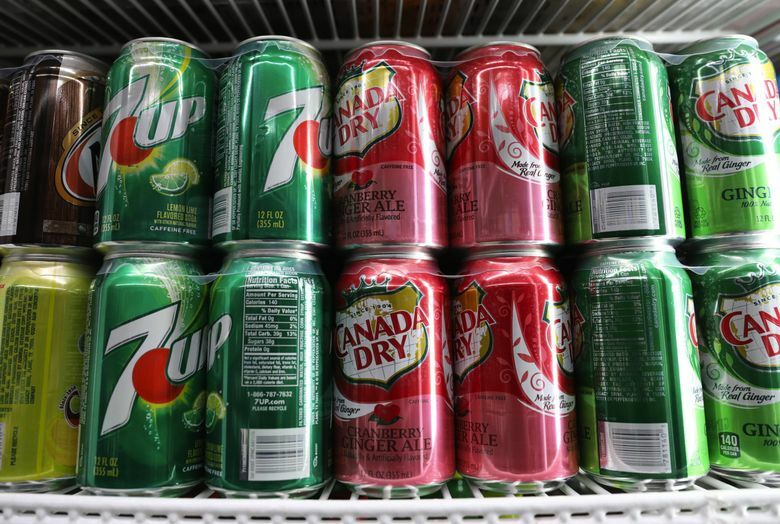 The initiative campaign was formed in late February, two months after Seattle’s 1.75-cents-per-ounce tax on beverages like soda and energy and sports drinks went into effect. Initiative supporters said they turned in about 291,000 signatures to the Washington Secretary of State’s Office on Thursday, and will deliver more signatures Friday, for a total of about 350,000. The campaign needs 259,622 valid signatures from registered voters to qualify for the general-election ballot. I-1634 is supported by a coalition that includes the Washington Farm Bureau, the Washington Food Industry Association, the Joint Council of Teamsters and Korean Grocers Association of Washington, the campaign said in a news release. But nearly all of the campaign’s $4.8 million in donations has come from four companies, state campaign-finance records show. Those companies are Coca-Cola, $2.3 million; PepsiCo, $1.7 million; Dr Pepper-Snapple Group, $709,000; and Red Bull North America, $55,000. When asked for comment Thursday, representatives for all four companies referred questions to the I-1634 campaign. The initiative is intended to help working people by protecting them from a regressive tax, campaign spokesman Michael Mandell said. The campaign left Seattle out of the initiative because it didn’t want to impact the city’s budget, which already anticipated the new soda-tax revenues, he said. The initiative generally wouldn’t apply to taxes on alcohol, marijuana or tobacco. Seattle’s soda tax has drawn fire for being regressive, and Washington state is already well-known for relying on a system in which people with lower incomes pay an outsized share of taxes. A spokesman for the Seattle Healthy Kids Coalition, which pushed for Seattle’s soft-drink tax, called the initiative disappointing. “It is disappointing that Big Soda is spending … to restrict choices for local towns and cities that struggle to support and sustain critical community programs for the public,” Aaron Pickus said in an email. Public-health and community leaders are evaluating whether to mount a formal campaign against I-1634, he added.